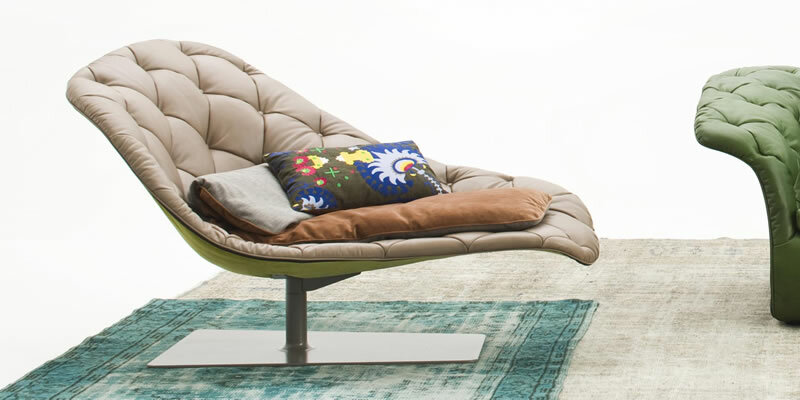 The Lounge Chair is one of the most famous designs by Charles and Ray Eames. 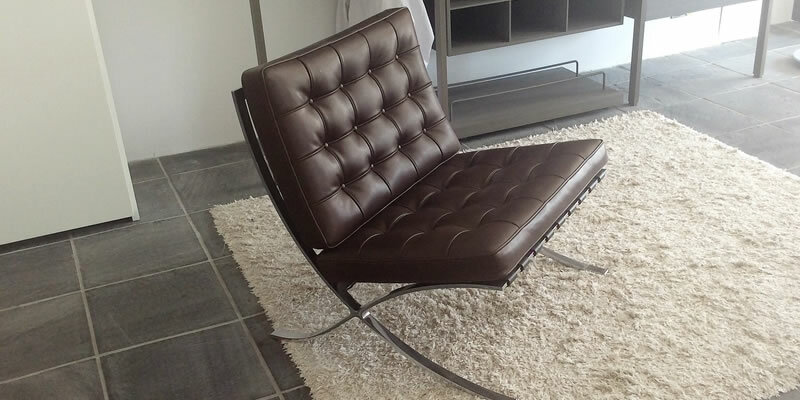 Created in 1956 it is now a classic in the history of modern furniture. 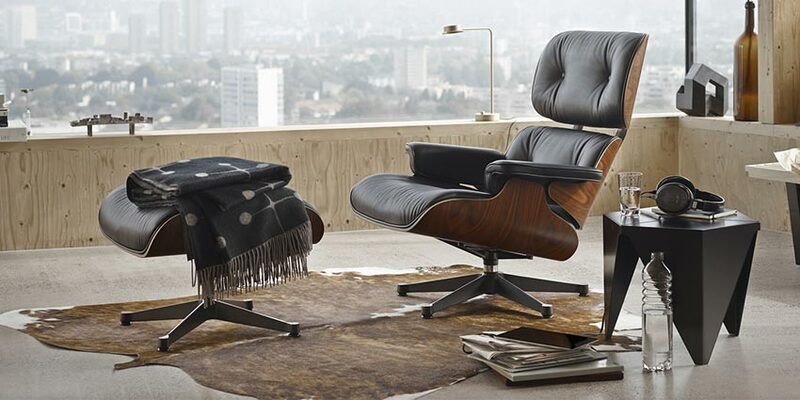 Since 1956, the Eames Lounge Chair has combined ultimate comfort with both materials and workmanship of the highest quality. 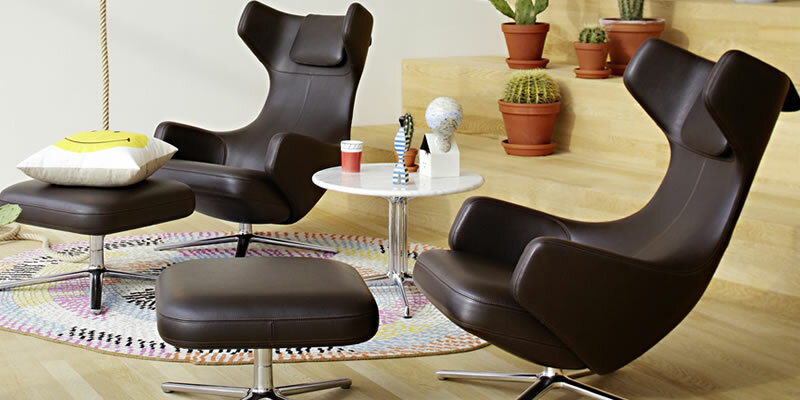 In the tradition of the English club chair, which inspired this classic design by Charles and Ray Eames, the original appearance of the Lounge Chair was defined by a dark wood veneer and black leather. 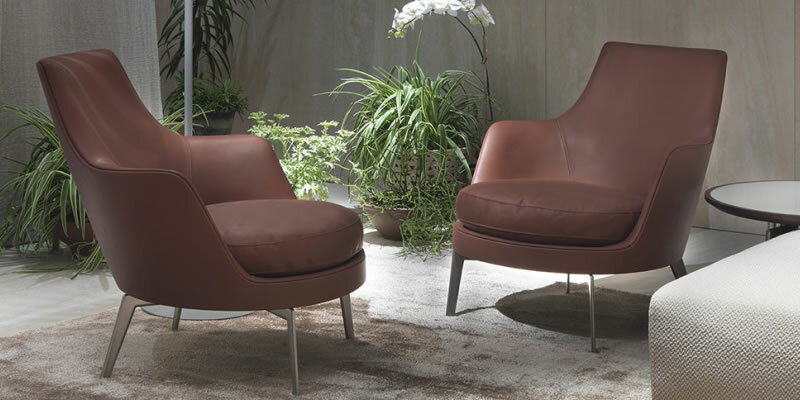 However, the Eameses also created an early version with light-coloured leather upholstery. 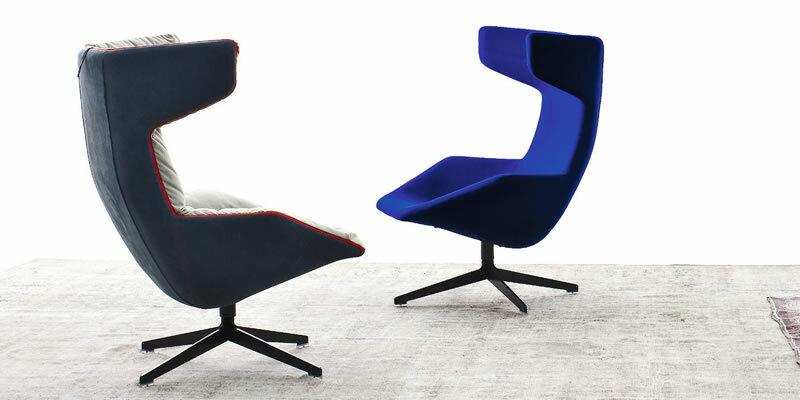 Developed in cooperation with the Eames Office, Vitra now introduces a new interpretation of the Lounge Chair. With white leather, polished aluminium and walnut veneer in a light finish, the new version harmonises perfectly with light-coloured interiors. Frame in double-panelled fir and poplar. Feet in brushed unfinished metal, antirust protection with matte varnish. Filling in differentiated density polyurethane foam. Springing with woven elastic straps in covered rubber. Seat cushions in washed and sterilized goose down with pads in differentiated density polyurethane foam. 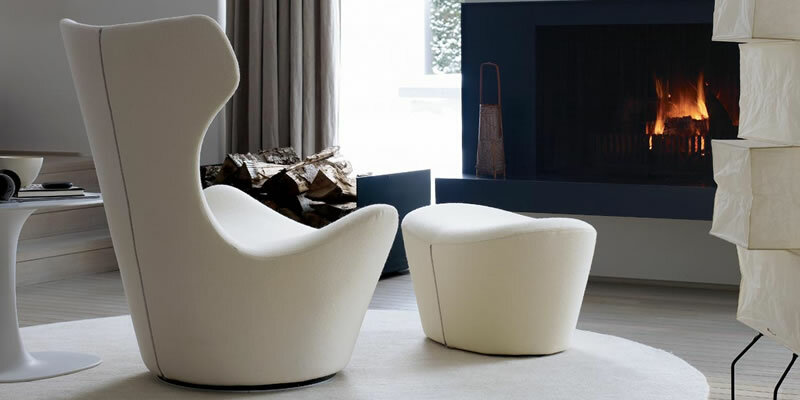 Swivel armchair on fixed base which can become a chaiselongue with different tilting positions. Steel frame, padding in CFC free polyurethane foam and polyester wadding. The back and footrest are movable; the different positions can be adjusted respectively through the use of a small lever operating a gas spring and of one side handle. Small lever, handle and base in nickelplated steel. 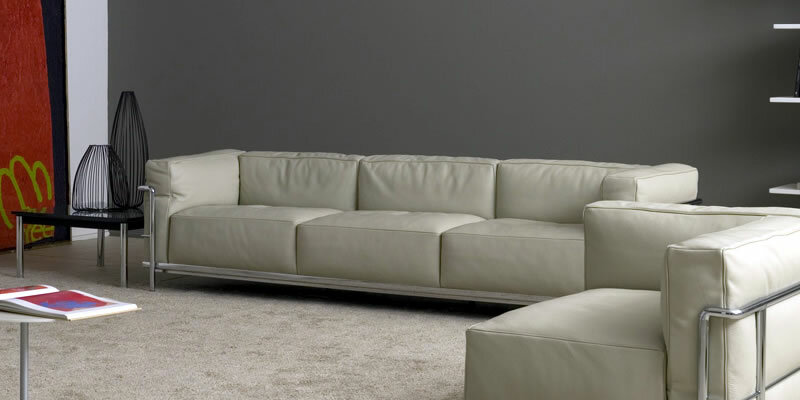 Fixed fabric or leather upholstery. Removable overcovers in special fabrics are available for head and footrest. Cars, spaceships, captain’s command chairs at the control panel, a host of references to fantasy boyhood worlds, and emotional triggers to the memories of games played there. A wraparound shell, which comforts and protects, a place to relax, rest your head, cut yourself off from the outside world. 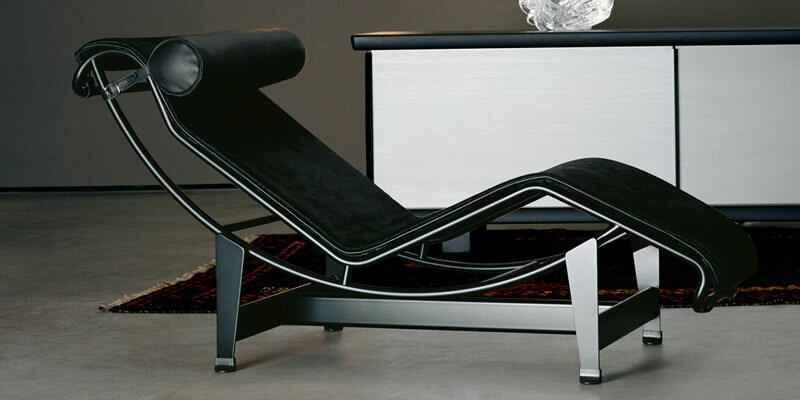 Designed in 2002, the lounger has kept its innate expressive power. 10 years on, it finds itself upholstered with a zip running the length of its profile, dividing the external from the internal. 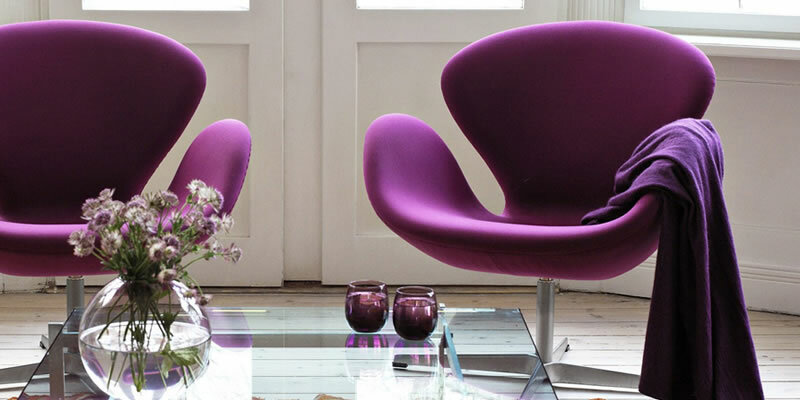 On the outside it is all precise, orderly geometry; inside, it is softness, bright colours and exuberantly feminine. Injected flame-retardant polyurethane foam over steel frame. 4-star, swivel (code 0V6, 389) or fixed (code 079, 390) varnished base. Available with padded quilt (code 340) or quilted fabric (code 354). Take a line for a walk covers are not removable. 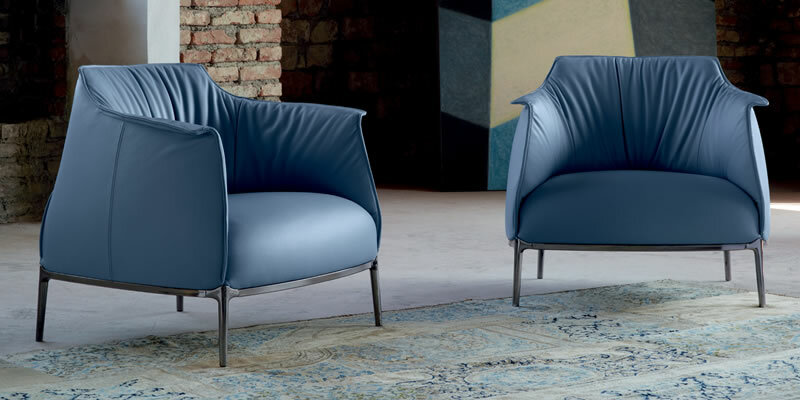 Swivel armchair (available in a fixed version as well) with seat frame in metal and expanded polyurethane, wrapped in protective fabric matched with stiff polyurethane. Goose feathers seat cushions with crushproof inset. Satinized metal feet finished chromed, burnished or rawhide covered (available in a broad range of colours). Upholster available in fabric or leather as well. 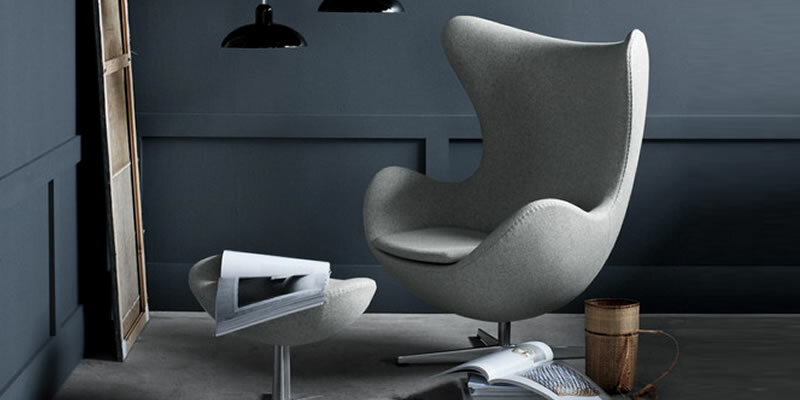 Matchable with a pouf and an ottoman. 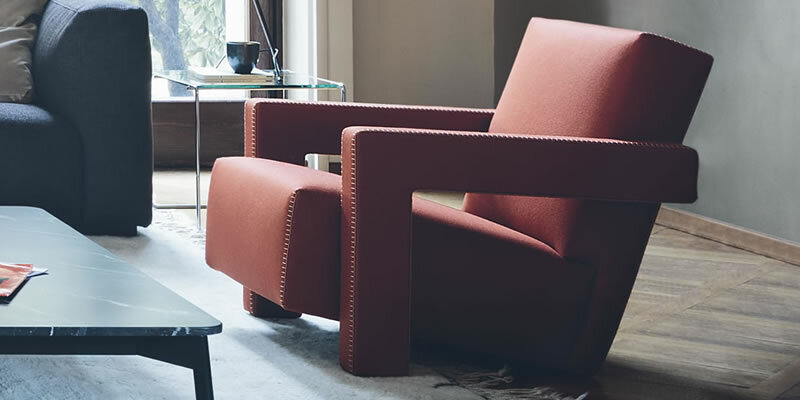 Jean-Marie Massaud has designed the Archibald Gran Comfort in a completely new interpretation of the Archibald project, of which it offers a refined and informal version. The central element is the large and soft seat cushion. The luxurious and soft leather bag with abundant goose-down padding sits in contrast with the architectural style of the steel shelf which supports it. 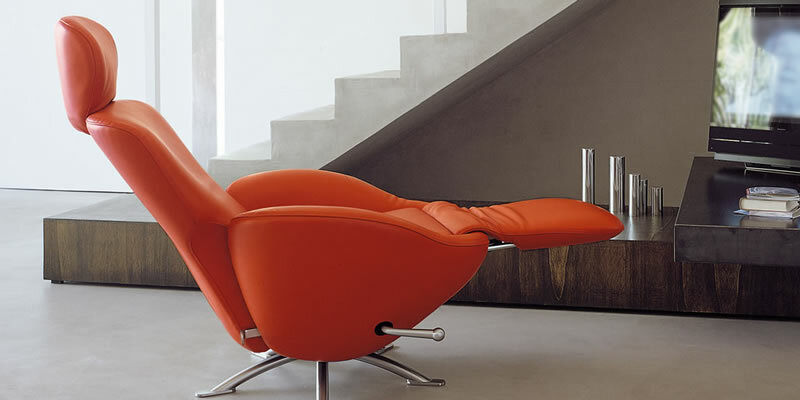 The suspension of the beech seat is achieved with elastic straps which continue along the outside edge of the steel-framed backrest for a further element of comfort. 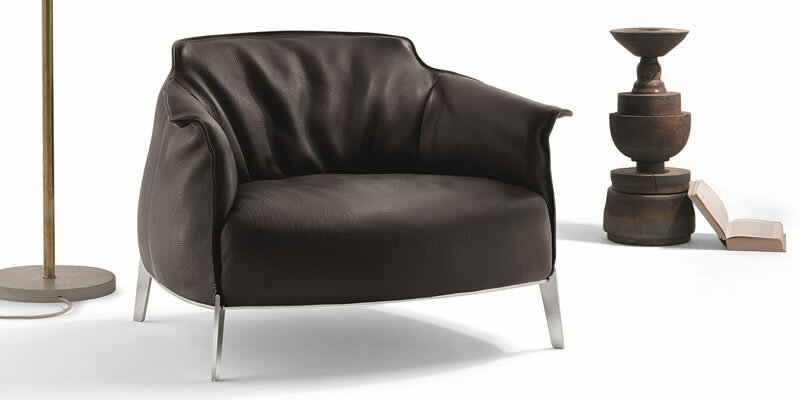 Armchair with steel supporting frame. Polyurethane foam and polyester padding. Feet in black plastic material. 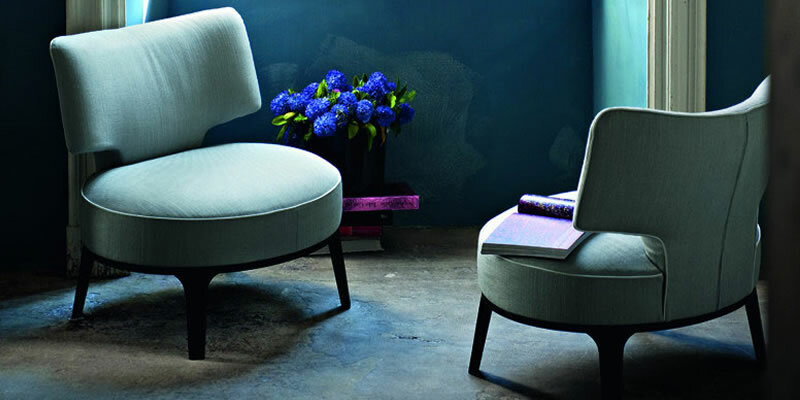 Upholstery in a wide and renewed range of fabrics in different colours or in leather with fine stitching available in two versions (blanket stitch or zig zag) with thread in five shades. Sofa, chaiselongue, armchair: HAPPY features an original back with a metal frame on which cowhide laces are stretched in a loose weave. A detail that adds character and allure, thanks to the fine handiwork. 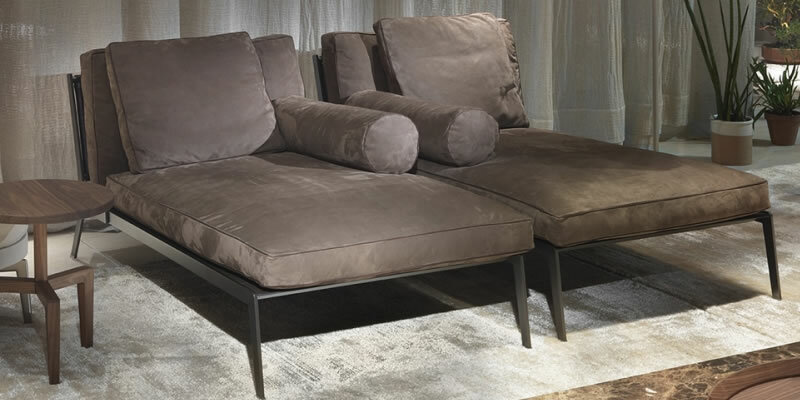 The wide, low metal base supports seat and back cushions in goosedown. 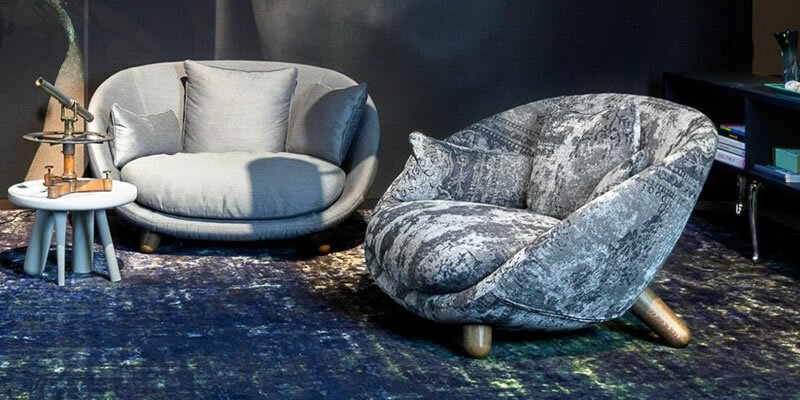 The Happy collection also has another special feature: there are no armrests attached to the structure, just bolster cushions that can be positioned at will, for truly personalized comfort. Designed for relaxation and reading. 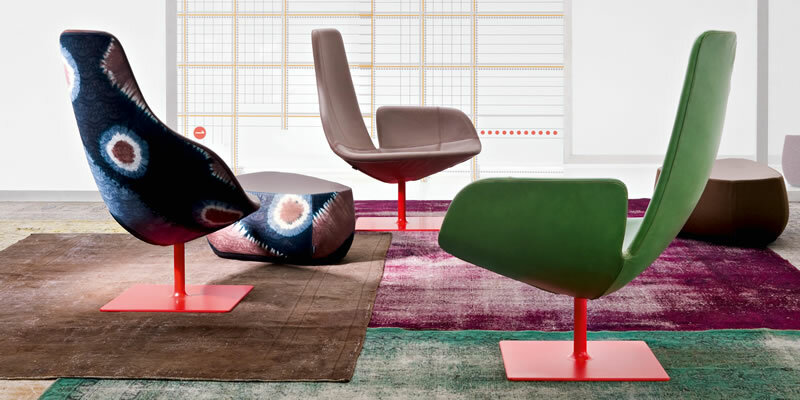 Its round, agile forms recall the dynamic, sophisticated designs of Carlo Mollino, enhanced with the expert use of materials. The combination of Pelle Frau® leather or fabric and Saddle Extra hide makes a come-back, further exalted by the elegant visible stitching. The back structure is in moulded polyurethane foam. The springing of the seasoned beech-wood consists of double-cone steel springs that are individually tied and attached to jute webbing. Mamy Blue, even in its swivel version, has its support base with 4 feet in solid wengé-stained ash wood (32) with a support fixing it to the frame in black-coated steel.. Pouf. Structure in seasoned beech and multilayer birch. The plinth resting on the ground is in multilayer birch in a black textured coat with protective plastic caps. 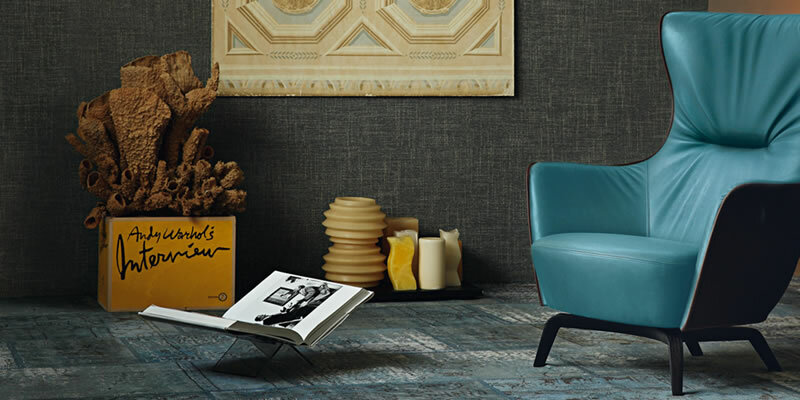 The upholstery is exalted by contrast stitching, matching the Saddle Extra hide of the lower part with the Pelle Frau® leather or fabric used for the upper surface. Headrest. Padded in polyurethane foam and goose down. 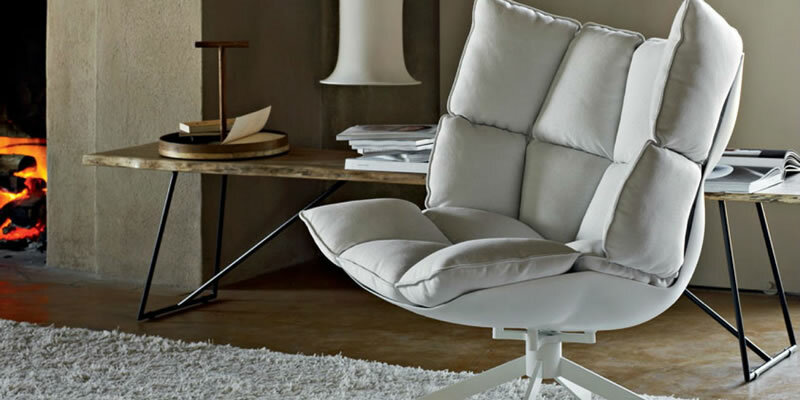 No need to be fixed into place, rather it is simply rested on the backrest, where it can be positioned at willthanks to a counterweight inserted into the lining. 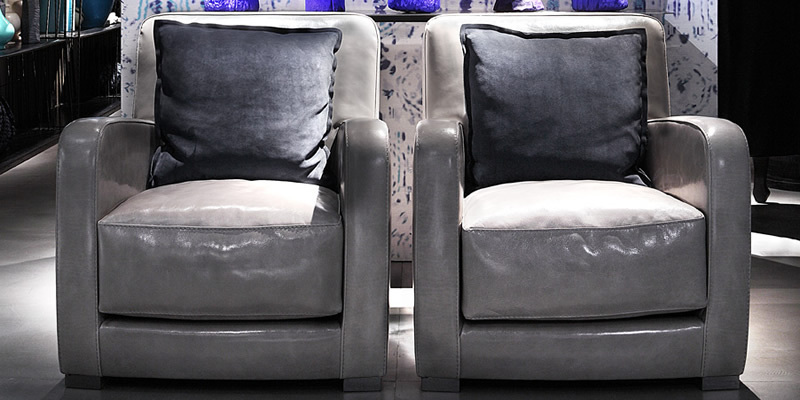 Pelle Frau® leather or fabric upholstery. 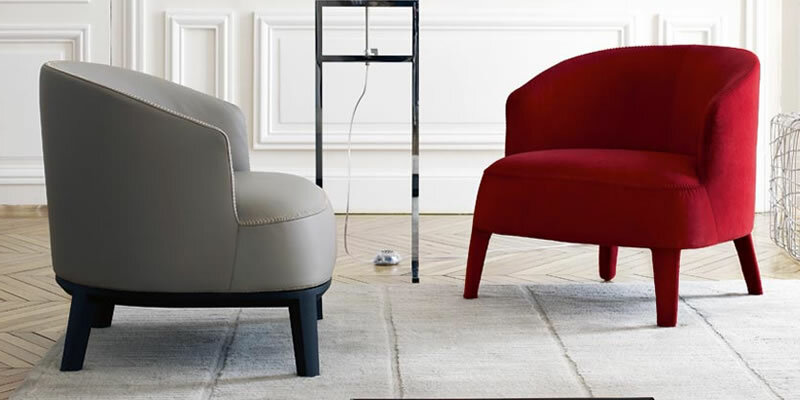 Chair, compact armchair and armchair. 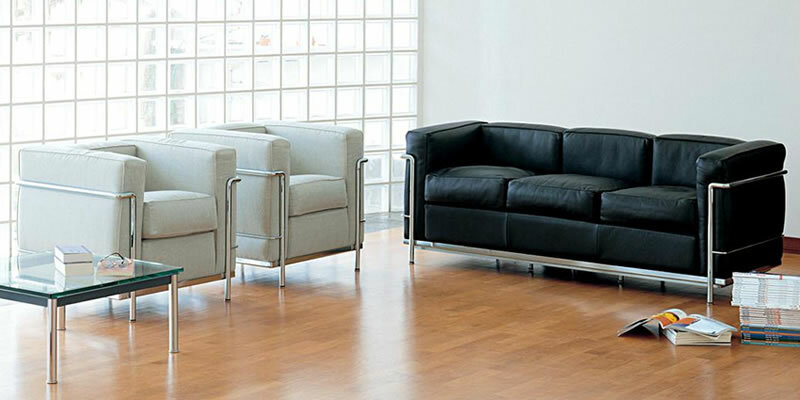 The Ami series also includes sofas in different dimensions and typologies. Structure: stainless steel. Base: acid-etched brass or in stainless steel with a satin finish or acid-etching treatment; provided with elastic belts and plastic spacers. Fixed seat for the chair and the compact armchair: cold injected, expanded polyurethane completed with elastic belts. Removable seat for the armchair: stress resistant expanded polyurethane; in this case, the elastic belts are integrated into the base. 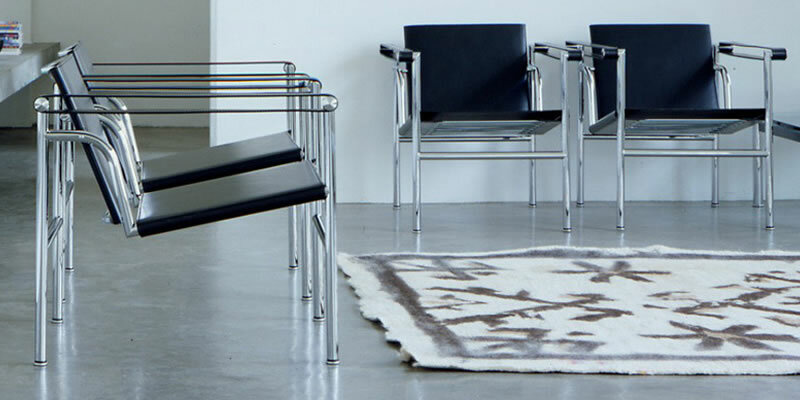 Structure upholstery: hand woven in Chain tubular knit. 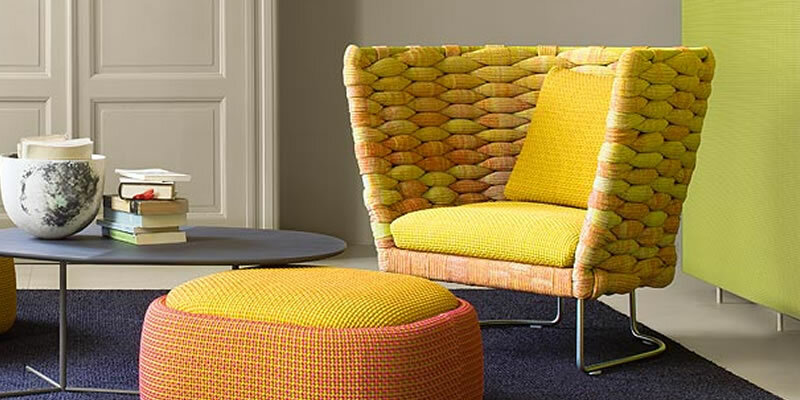 Seat cushion upholstery: available in a selection of fabrics in the Collection. 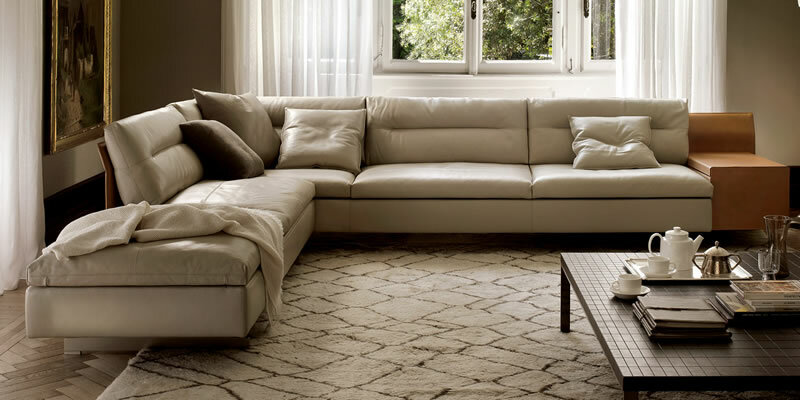 Notes: loose cushions are necessary for enhanced comfort; quantity and dimensions depend on the selected product.